At this column’s moniker would imply, I usually focus on a particular aspect of a game’s design and how it challenges design conventions. Not this week. Instead, I’m focusing on a sequel that doesn’t challenge any conventions and considering what that means for the game, the series, and the industry as a whole. That game is The Legend of Zelda: Spirit Tracks. Depending on what side of the fence you reside, it either represents the best or worst tendencies of the Zelda franchise. In many ways Spirit Tracks is the least innovative Zelda title in ages. Ocarina of Time brought Zelda into 3D for the first time. Majora’s Mask redefined the Zelda structure in a mess, yet fascinating experiment that has yet to be replicated. Wind Waker brought an all-new visual style, as well as a new mode of travel in the sailing. Phantom Hourglass innovated upon that with its use of DS-specific controls. Even Twilight Princess had Link switching into a wolf for half the game. All these Zelda titles marked a step forward for the series in at least some capacity. Spirit Tracks, by extension, is a step back. Aesthetically, it sticks to the rather tried-and-true formula of forests, snow levels, fiery mountains, etc, with hardly a new visual gimmick to its name. Link goes back to having a musical instrument (a series mainstay dropped from Twilight Princess). The game’s formula of going into a dungeon, getting an item, and then using said item to solve a bevy of puzzles and defeating a boss for a heart container is as old as the series itself. 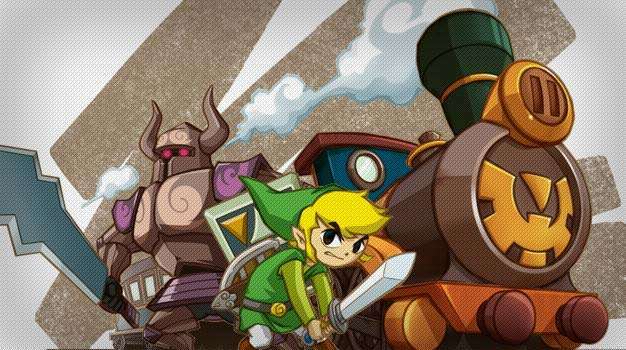 Even the one notable new addition, the train, is no more than an offshoot of Phantom Hourglass’ steam-paddler. Those tired of the Zelda formula will likely write it off as a by-the-books Nintendo sequel, but I say there’s some value in it being exactly that; the game is exceptionally well designed and learns from the mistakes of its predecessors to deliver a tighter, crafted refinement on 20 years worth of Zelda goodness. 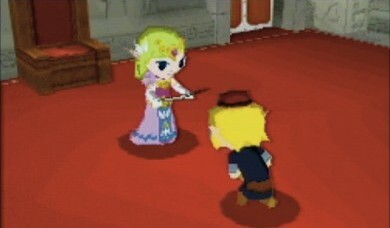 While the game owes its strengths to two decades of the series, the game is most widely influenced by its two immediate predecessors in this, the cel-shaded branch of the franchise; Wind Waker and Phantom Hourglass. Wind Waker set the mold with its expressive art style and playful tone. Sadly, it had a host of problems with pacing; offering too much clutter, useless collectibles, and copy-and-paste side-quests. Its immediate sequel, Phantom Hourglass, offered a far more streamlined adventure. Gone were the bevy of items rarely ever used and the traveling was better paced, and it was a leaner, tighter experience for those improvements. Unfortunately, Phantom Hourglass too had its problems. Being the first DS incarnation, the game played it safe with its puzzles, offering far fewer head-scratching moments than the series is renowned for. It tested some new waters (quite literally with the introduction of the boat), but was still rough around the edges. This is most notable in its puzzle design; rather than making you hold onto useless items, later dungeons and bosses ensure you make quick work of every tool in your toolbox. So, while Spirit Tracks starts off by-the-books with the typical, simple, and tutorial-heavy starter dungeons, from there it just keeps building. By the end I was really scratching my head a number of times – something I haven’t done in a while with a Zelda game. I’ve always liked difficult puzzles in my Zelda games and in many ways the Ocean Temple in Ocarina of Time represented the pinnacle of challenging Zelda puzzles. Except for one niggle: it wasn’t very fun. You had to keep pulling out your ocarina, play a song, and watch a cut scene every time you wanted to adjust the water’s elevation in the dungeon. The puzzles were solid, but the execution left something to be desired. Contrastingly, the puzzles in Spirit Tracks are just as hard but far less tedious to execute, a perfect example of the latest Zelda learning from the series’ rich history. Zelda finally gets her moment in the spotlight. Zelda games have gradually introduced better and better sidekicks as well. There was the annoying Navi in Ocarina, then the mysterious King of Red Lions in Wind Waker, and following that the crafty Midna in Twilight Princess. Yet – and somewhat finally – Spirit Tracks brings the titular princess along for the ride and she’s no slouch. In my favorite line in the game, Zelda suggests she wait here while you go on adventuring. “It’s sort of a family tradition,” she mutters, before the sage advises her to come along as one boy can’t possibly do this alone. It’s here that the game carves out a new identity for itself; Zelda finally has a personality. She’s no longer the regal, kindred spirit of games yonder but a feisty, little girl who’s outraged at her current predicament of being without a body (you would be too, I think – Ed). For once, I actually cared about Zelda as a person. As for the story, it remains the same as ever, something about the power of gratitude and friendship possessing magical properties that can be used to smite the powers of darkness, or evil, or something. It’s so vague and hazy that it shouldn’t resonate much, but it does thanks to the designers wisely deciding to show rather than tell most of the characters’ relationships. Link continues to not talk, but he and Zelda high five, hug, and in a moment that surprised me with its emotional resonance, held hands. The villain and overall plot are forgettable, but the moment to moment interaction between these characters is too adorable for words, renewing the series’ magic that was in danger of getting lost. You’ve probably gathered by now that I really liked the game – a lot. But where should the series go from here? Even though I loved the game, there’s still room for improvement. I’m still not sold on the musical instrument thing, and I’m not sure that anyone would really miss rupees – the economy in these games has always felt a bit busted, and slashing shrubbery and breaking pots for currency just feels a bit rote by now. And the fact that the game has to explain what an item does every time you find it has always been a series bugbear. But these are fairly minute complaints and I’m not confident that they’re worth going back to fix. Rather, I feel like they’ve taken the series about as far as it will go on these principles and that it’s time for another sea change. I wasn’t the biggest fan of Majora’s Mask, but I liked its melancholy tone, focus on side-characters, and its unique twist on the Zelda template — even if I found it wasn’t very fun (not unlike Ocarina’s Ocean Temple). But it’s been a decade since that game came out, so maybe they could use the lessons learned since to create a more engaging, playable Zelda adventure that picks up where the ideas of Majora’s Mask left off. If Spirit Tracks has proven anything it’s that you can’t make a masterpiece overnight. It takes several iterations to really perfect a solid formula. Innovation is great and all, but sometimes the best improvements are the subtlest and that’s something we shouldn’t take for granted.